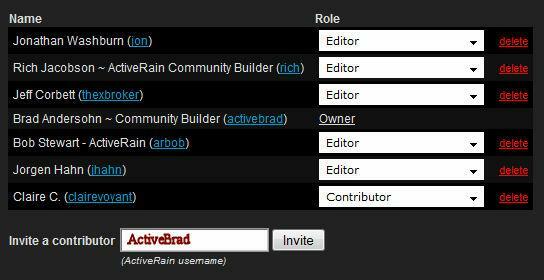 How To Create A New ActiveRain Outside Blog for an Individual, Group, or Team. I’ll demonstrate how to set one up from scratch. Following these steps correctly should have you setup in about 15 minutes including invitations out to your desired contributors. 1) Make sure you are Logged into ActiveRain. 2) Click on the “My Home” link located at the top of your screen in the upper right corner. 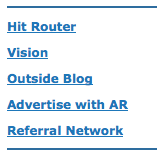 3) Click on the “Outside Blog” link located on the left hand sidebar of your “My Home” page. Your Team Blog has now been created. on your “My Home” page and begin writing a new post. 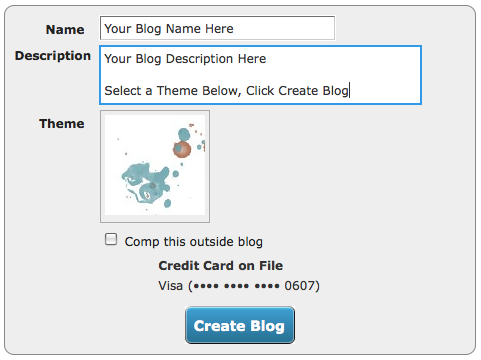 NOTE: Your posts are still created in ActiveRain, but before submitting them, be sure to click on the check box to add them to your OUTSIDE Blog. You can also add previously written posts by going to a post, select edit, then check the box to add it to your Outside Blog. You will also receive an email that confirms the creation of your new Blog. There will be a link to the temporary internal site (ie: 09567de4.ActiveRain.com) Click on this Blog link in your email, and you can now go in and customize your Blog with your own domain name that ActiveRain will host, or you can add a domain name that you have previously purchased. 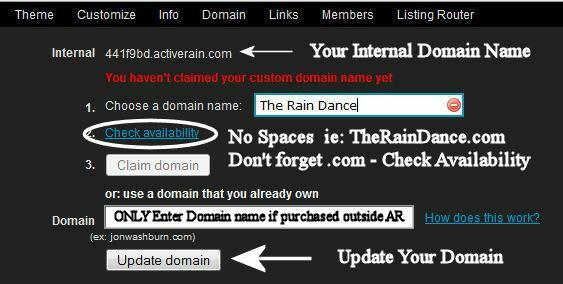 NOTE: Only enter a domain name in the “DOMAIN” box at the bottom if you already own one. This would be a name that you have previously purchased and wish to use. (this can’t be a domain where you already have data in use) If you do select an outside existing domain name, you will need to click on the blue link that says “HOW DOES THIS WORK” This will show you the information you’ll need to give to the site where you purchased your domain name. example: TheRealEstateScoop.com purchased from GoDaddy.com etc. Once you click on the update domain button, you’re done, now you’re ready to use the toolbar below for additional features, and then it’s time to invite other contributers, add listing router, create links, widgets and more. 8) If you chose to Invite other members as contributors to your team/group Blog, click on the “Members” link: The following screen will appear: You can add them as Editors, Authors, or just Contributors. AR Team Blogs and Individual Blogs are the same thing, the only difference is if you wish to have multiple contributors or not. They can choose to accept or decline your invitation. If they accept, their photo will be automatically added to the new blog as a frequent contributor, and they’ll have the ability to start posting or moving posts over immediately. To see an example of an Individual Blog setup, check out Bill Gassett’s outside Blog at MassRealEstateVoice.com. Look at how the “RAINdexing” on his site is already working wonders with all his previously written content. Also, See Bill’s Post on Individual Blogs. To see a group Blog, go to ActiveRainGuide.com or ActiveRainTeam.com to compare a multi-authored Blog. 10) You will be able to modify, edit, make changes, add listing router, create links and more by simply using the toolbar options at the top of your new outside Blog page. I apologize for this extremely long tutorial post, but these are the steps you’ll need to go through to create your NEW ActiveBlogs. One of the things this price includes is support from myself and the AR staff and team. Plus you’ll get BIG SEO, RAINdexing, Themes, Wider bandwidth, Widgets, and the ability to mange your invited contributors. We’re here to help, but if you follow these instructions, you’ll probably never need us. Need more details? 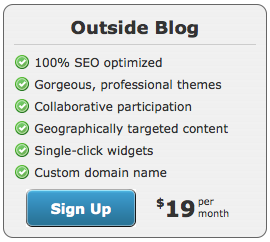 Here’s How To Create & Maximize Your Outside Blog. Here’s 5 Ways you could use a group or team Blog.